The Reeds – we know from Indentures dated 1821 and 1839 that the house was a ‘messuage late of William Reed deceased but now of Daniel Reed formerly called the Seven Stars’. We know from earlier land tax records dating from 1780 that both William Reed and his son Daniel Reed lived in this area of the town, presumably in this house. Thomas Bevan – in the 1851 Census the Severn Stars was occupied by Thomas Bevan aged 32 from Thornbury and his wife, Ann aged 36 and their children Mary aged 4, Ann aged 3, Henry aged 2 and Emma aged 4 months. Thomas was a beer seller and pig dealer. They had one general servant, Mary Ann Biddle aged 17. Thomas was born on 1st September 1819 and baptised on 7th September, the son of James Bevan, a cattle dealer and his wife, Ann. In the 1841 census Thomas was a servant working in the Vicarage. On 24th February 1846 he married Ann, the daughter of James Parnell, a carpenter and his wife, Hannah. Thomas and Ann had a large family. The baptism record of their daughter, Mary, on 5th April 1846 shows Thomas was still a labourer, and that of their daughter, Ann, on 27th June 1847 shows that Thomas had become a dealer. Their next seven children were all baptised after Thomas had become a beerhouse keeper: Henry, Emma, Fanny, James, Alfred, Caroline Elizabeth and then George on 1st April 1860. Finally they had one more child: Albert Edward baptised on 2nd February 1862 by which time Thomas had reverted to a labourer. It would appear Thomas took over the Seven Stars in late 1840’s and the 1856 Trade Directory still lists him as being there. By the 1859 rate book and 1861 census he had become innkeeper at 31 High Street. George Ford, the local pub historian, says that this pub was known as The Lamb, but we have found nothing to confirm this. Thomas must have given up the inn shortly after as in the 1862 rate book the place has no occupant listed and Thomas’s name is listed in the book with a note saying the ‘arrears’ were due, either from Thomas or the owner of that property, Harriett Mawley. Mary Bevan was born in 1846 and baptised 5th April 1846. Mary married Joseph Sainsbury, a plaster, on 31st July 1875. Ann Bevan was baptised 27th June 1847. She married James Tremain, a groom on 13th April 1882 and they moved to Bath. Henry Bevan was baptised 18th March 1849. Emma Bevan was baptised 15th December 1850. Emma and her sister Caroline Elizabeth got jobs in Toxteth in Liverpool as servants of a sugar refiner. Emma married Henry Symons, a draper, on 29th October 1881. Henry was living at London Road in Liverpool at the time of their marriage. They later moved to Bath. Fanny Bevan was baptised 12th December 1852. Fanny married James Parker, a labourer on 4th April 1874 and they emigrated to the USA, arriving on 15th May 1880 on the ‘Bristol’ and they settled in Wayne, Indiana. Alfred Bevan was born on April 27th 1856 and baptised 1st June 1856. He married on April 20th 1879 at City Road Baptist Church in Stokes Croft, in the St Paul’s district of Bristol. He was a tinplate worker. His wife was Sarah Ann Cotterel. We have a photograph of them here on the left. Their children were Thomas Henry Bevan born 10th January 1883 in Wells, Alfred John Bevan born 1887 in Aylesbury, Florence May Bevan born 1892 in Aylesbury (Florence married Sidney Herbert Dearing ) and Lily Elizabeth Bevan born 1879. George Bevan was baptised 1st April 1860. Henry and Elizabeth Keel and Elizabeth Craddock – the 1861 Census shows Henry Keel as beerhouse keeper of the Severn Stars. He was aged 44 and from Thornbury. His wife was Elizabeth aged 34 from North Nibley, and living with them were a son, William Grigg Keel, aged 11 from North Nibley and Eliza Keel, Henry’s sister, aged 42 sister from Aust. Henry had married Elizabeth Grigg in the Clifton area of Bristol in 1858. He died and was buried on 7th September 1865 aged 50. In 1870, Elizabeth re-married, this time to William Craddock. Unfortunately he lived for less than one year after the wedding. He died and was buried on 29th March 1871 aged 46 years. The 1871 and 1881 censuses show Elizabeth as the beerhouse keeper. We know she carried on to at least 1884 as the Bristol Times and Mercury reported that she was fined 10 shillings, had to pay 14 shillings and 6 pence in costs and had her licence endorsed for permitting drunkenness to take place on her premises. On 6th August 1884 she was also convicted of keeping swine within 50 feet of a dwelling house. She was fined £1 with 8/6 costs or 21 days hard labour if she refused or could not pay the fine. In April when the licence came up for renewal the authorities refused to grant it a licence. William Hicks – the 1887 rate book and the 1891 census shows that William Hicks was occupying the premises. It had ceased operating as a beerhouse and become a lodging house. Living there were William aged 47 from St Georges, Sarah Ann Hicks aged 42 also from St Georges, and Sarah Ann Hicks aged 8 from Bristol. William Hicks is listed in the 1899 Thornbury trade directory as a lodging house keeper at Bath Road. The Bristol Mercury shows that the property was put up for sale in August 1886. It was described as ‘well built dwelling house with large garden in the rear thereof containing 38 perches more or less situate in Chapel Street in the Town of Thornbury and lately known as the Seven Stars. The house contains a sitting room, kitchen, shop, pantry, back kitchen, six bedrooms and on the premises are Brewhouse, stables and pigstyes. This lot is in the occupation of Mr William Hicks as a quarterly tenant at a rent of £15 per annum’. William and Sarah had moved from Bristol. In the 1881 census, William was a haulier living with Sarah, a staymaker, in 1 Boynton Terrace, St Werburghs in Bristol. Leonard and Elizabeth Ann Smith – the 1901 census shows the lodging house was now being run by Leonard and Elizabeth K. Smith. Leonard was described in the census as working as a general labourer aged 34 from St George. He must have been a labourer alongside being a lodging house keeper, although it is likely that Elizabeth (aged 25?) did most of the work. It is interesting to note that this census, several of the trade directories and electoral registers locate the Seven Stars in Chapel Street during the early 1900’s. This is yet another name used to describe this short length of road. Living with Leonard and Elizabeth were their children, George A aged 4 from St George and Edward H aged 2 from Cold Ashton plus seven lodgers and two visitors. They had at least one other child: Doris born on 15th June 1904. Leonard was born about 1867, the son of George and Mary Ann Smith. In 1881 Leonard was working as a shoemaker living with his parents at Rodney Lane, St George, Gloucester. In 1891 he was still a shoemaker living with his widowed mother at the same address. Leonard married Elizabeth Kate Little in Bristol in 1895. Leonard’s wife was ‘Elizabeth K’ as recorded in the 1901 census and as ‘Elizabeth Kate’ in the 1911 census, but was later referred to as Elizabeth Ann. We are not sure whether she just used different middle names at different stages of her life or whether she was a different person. Their son, Leonard Frank, who was baptised on 2nd March 1902. The 1911 census described Leonard as a general labourer. He and Elizabeth were living with their three sons, George Aaron, a box maker aged 15, Edward Henry aged 12 and Frank Leonard aged 9 and daughter, Doris May aged 8. They also had 19 lodgers. That’s 25 people living in a 9 roomed house! During the First World War, Leonard’s son, George Aaron Smith, was killed in France on 26th October 1917. He was serving as a Lance Corporal with the Royal Warwickshire Regiment 15th Battalion. He is listed on the memorials at Tyne Cot and at St Marys Church. George had married Olive May Johnson in Bristol earlier 1917. She re-married in 1918 to Frederick Counsell and they lived in Factory Lane, Kingswood. Leonard and Elizabeth continued operating as a lodging house throughout the 1920’s and 30’s. The Gazette of November 6th 1926 shows that Len also kept up one of the traditional pursuits in Thornbury. The article says that he was “lawfully searched on a certain highway by complainant, who had cause to suspect him of coming from land where he had been unlawfully in search and pursuit of game.” Len had been stopped by the police coming from Vilner towards Upper Bath Road and he admitted to having a rabbit in his pocket. On being searched, he was found to have another rabbit in his pocket. He was fined £1. The rabbits were confiscated and probably gave the police a good meal! Leonard died on February 12th 1937 aged 72 years. Elizabeth carried on living there until she died on 25th March 1950 aged 75 years. Several locals have told us that the land behind the lodging house was used to keep pigs even when the building was used as a lodging house. There were a large number of pigsties used by Thompsons who ran the grocers on the High Street. People regularly saw pigs been driven through the front door of the house to take them to and from the market or elsewhere. 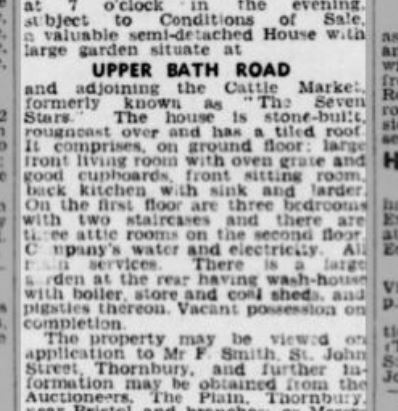 The Western Daily Press of 8th April 1950 advertised the sale of the property as part of the estate of Leonard Smith deceased. The pigsties were still mentioned as being part of the property. The Barnes – the 1954 electoral register shows Peter and Ellen Barnes were living at the Seven Stars. Peter was Ellen’s son. Peter Warwick Barnes was born in 1920, the son of Percy Barnes and his wife, Ellen Maria (nee Warwick). Percy and Ellen had married in the Bedford area in 1909. On 30th May 1949 Ellen, already widowed, bought a house in Chapel Street (later known as 8 Chapel Street) for £1000. She moved to Thornbury from her previous address at 4 Kent Road, Bishopston, Bristol. The 1950 electoral register shows that Ellen’s daughter, Betty Warwick Bayntun and her husband, Robert Hippesley Bayntun also moved with her. On 25th July 1952 Ellen sold the house to her daughter, Betty and Robert Bayntun for £700. Ellen had already moved to the Severn Stars. On 18th November 1953 Betty and Robert sold the Chapel Street house. In 1954 Peter married Mary Janetta Boys in Bristol. He was a reporter working for the Evening World in Bristol. Peter and Mary were living at the Seven Stars in 1957 when their daughter, Fiona Mary was baptised. They had another child, Rex. The 1958 electoral register shows Peter and Mary in the Seven Stars, but Ellen had moved a few doors away at 15 Rock Street. Peter didn’t stay long. Ellen died in 1959 aged 77. Peter died on 8th May 2007. The Hills – the next family to own and occupy the house were the Hills. We have been told by George Dixon, a local person, that Mr Hill was a musician who played for the Bournemouth Symphony Orchestra and that he had lost a leg in the First World War. We subsequently discovered from the electoral registers that it was Marion Hester Hill who was living in property in the 1961 and 1965 electoral registers and after when it was earmarked for demolition by the Council as part of the Town’s re-development. In 1967 Marion acquired 44 Castle Street and moved there. She died on 24th March 1975. One of her executors was Alfred Vernon Hill who was also living at 44 Castle Street at the time. We note that Alfred V Hill married Jean Samuel in Thornbury area in 1974. Further research, prompted by a contact from a descendant of Alfred Vernon Hill led us to find out more about this family. Marion was the daughter of William James Parker Lansdown. On 8th June 1927 Hester married Robert Irving Hill in Stoke Bishop, Bristol. Robert had been born in Bangor in 1898, the son of Alexander Scott Hill. Robert enlisted in 60th Battalion County of London Regiment on 4th September 1915 and in 1917 transferred to the Labour Corps. He was severely wounded in Etaples in France. We don’t know anything about Robert except that he was listed as a solicitor in Bristol in 1955 and that he died in Sutton area of Surrey in 1988 aged 91. It would appear therefore that Robert and Marion separated. We are puzzled because we have not been able to establish the connection between Robert or Marion and Alfred Vernon Hill mentioned above and we would be interested in hearing from anyone connected with the family in any way.